Punt Casino is a colorful online casino that targets players from South Africa. Lots of games, generous bonuses and great customer support – all this you can expect when signing in to this casino. More detailed information about this gaming institution you will find in this Putn Casino review. The casino website is blue with bright games banners. On the main page of the website you can see popular and latest games and current promotions. There are options to log in or to register, to chat with a member of support team or explore banking methods etc. The interface is very simple and the website is easy to use. Punt Casino belongs to Zewor N.V. – a company that operates through license obtained in Curacao. There is no need to download the casino to your computer, you can play instantly; but if you wish to download – there is this option. You can play your favorite games for free in demo mode or for real money. 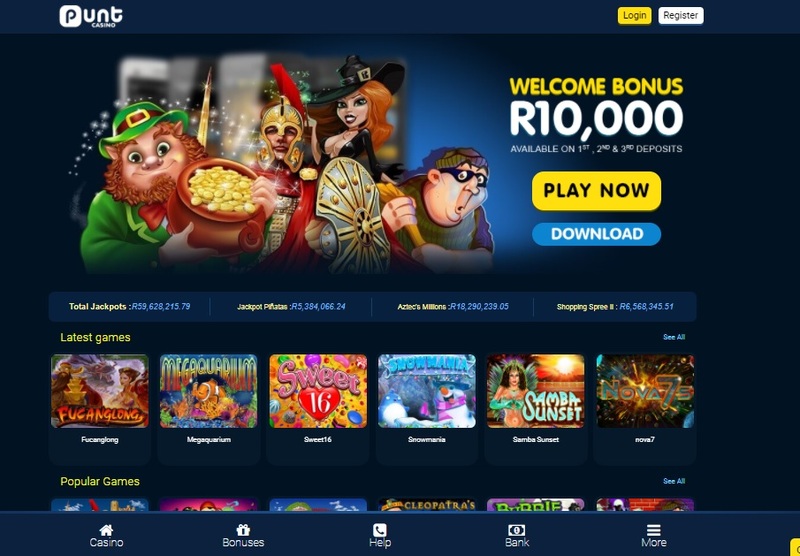 The software which Punt Casino uses is RTG, so loved by many South African players. The website is available in English only. There is a mobile version of the casino with more than 120 games. There is a good choice of popular games of different genres: table games, card games, slot games. You can also find games with progressive jackpots here. The generous promotions are run in Putn Casino on a permanent basis. Casino offers daily 15% cashback on your losses. Other daily bonuses and VIP program are also at your disposal. South African players will be happy to know that the official casino currency is RAND. You can deposit money and take your winnings using. Visa, Mastercard, Easy EFT, SD, EcoPayz, Neteller, Skrill and Bitcoin. The minimum deposit in Punt Casino is R25. If you have any question, customer support members will assist you by online chat 24/7. From Punt Casino review above you can judge on its pros and cons and decide for yourself if you want to try your luck in this gaming house.